You may have heard a new phrase in health news: text neck. Text neck describes the pain caused by looking down at a cell phone or other device, too long and too often. The posture of bending your neck to look down does not only occur when texting, and is not a new practice. We bend our necks to look down while reading or writing, for example. The problem with texting is that we are doing it for longer periods of time. Staring down strains the back of the neck, as the muscles are in a persistent state of contraction, by trying to pull and support the head (which weighs 8-10 pounds). Moreover, when bent, your head puts more force on your neck. For example, when bent at a 45 degrees, your head is actually exerting 49 lbs of force. 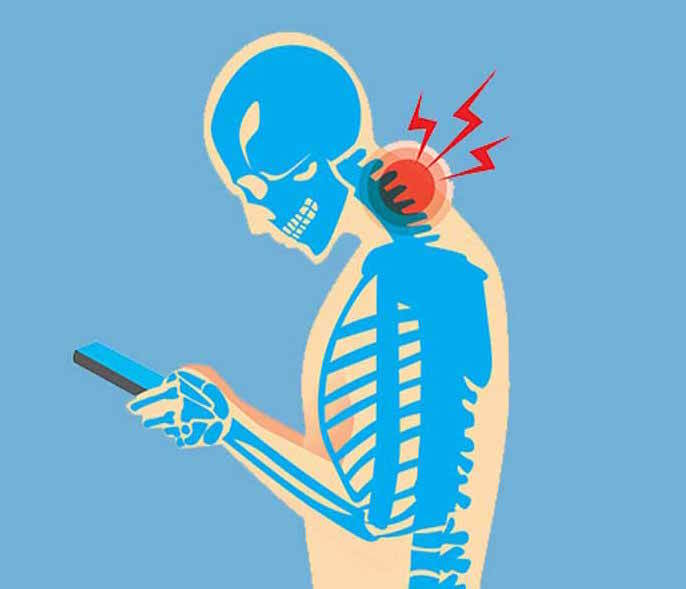 Text neck doesn’t only cause pain and discomfort to your neck, but can also cause chronic, nagging, and/or sharp pain and severe muscle spasms. If a cervical nerve happens to become pinched, it is possible for the pain to radiate down your arm and into your hand. Over time, onset arthritis, compressed spinal curve, degeneration of the spine, and even spinal misalignment can occur. The good news is that there are some tips and tricks to stop the development or advancement of text neck. For starters, hold your cell phone and tablets at eye level as much as possible, and keep your laptop positioned on a platform in order for it to be at eye level. Take numerous breaks from your screen throughout the day. You can also change your position so instead of sitting up, try laying down to take some strain off your neck. Lastly, practice good posture so that your body can stay in alignment. As always, if the pain/discomfort persists, visit your chiropractor as adjustments can help.